corn tortillas | Let There Be Food! Oh Tex-Mex, how do I love thee? Let me count the ways. You make bad days better. You are good for what ails me. You bring me joy, deliciousness, and comfort – without fail. You are variety with consistency. You are both crunchy and creamy. You are chile gravy with cheese. You are breakfast tacos. You are chips with nooks to fill with salsa. You are one of my favorites and I could eat you every day without boredom. Yes, Tex-Mex, you are my one of my all time favorites and I will never leave you. Dearest reader, you may be thinking my love affair with Mexican/Tex-Mex food seems a little over the top. But as any good born-and-bred Texan knows: it is totally valid. Ask any of those poor displaced Texan souls who are living in the lands of poor quality Mexican eateries where spicy ketchup substitutes for salsa and they will tell you – their heart longs for that of which I speak. Bless the hearts of those who have lived away from the land of deliciousness for so long that they begin to actually think that the “Mexican” food in their area is an acceptable representation. Dear friends, hurry back to the Lone Star State! Hurry back to land of chile gravy, quality salsa, homemade guacamole, homemade tortillas, (corn and flour please! ), and hole in the wall joints that will feed your soul. In the meantime, please consider this super simple meal to tide you over until then. There is nothing complicated or surprising about this dish, and truthfully, that’s part of why I think my perfectly portioned tostadas are so darn great. Part of what makes this dish so fabulous to me is the home-crisping of the corn tortillas. 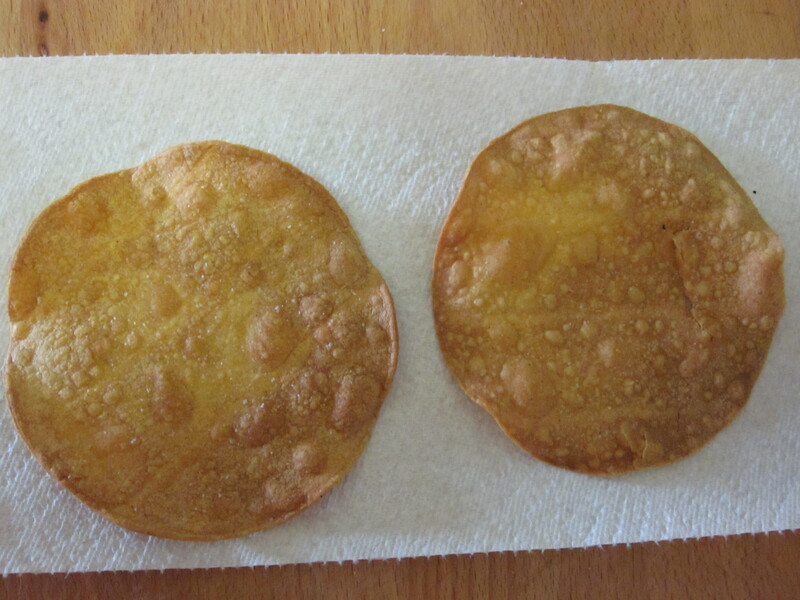 I know you can buy pre-crisped tostada shells at the supermarket so you may be thinking to yourself, “why would I need to buy regular tortillas to crisp when I can buy them that way and skip a step?” Well, in my opinion, home-crisped are superior in flavor and texture to the others. 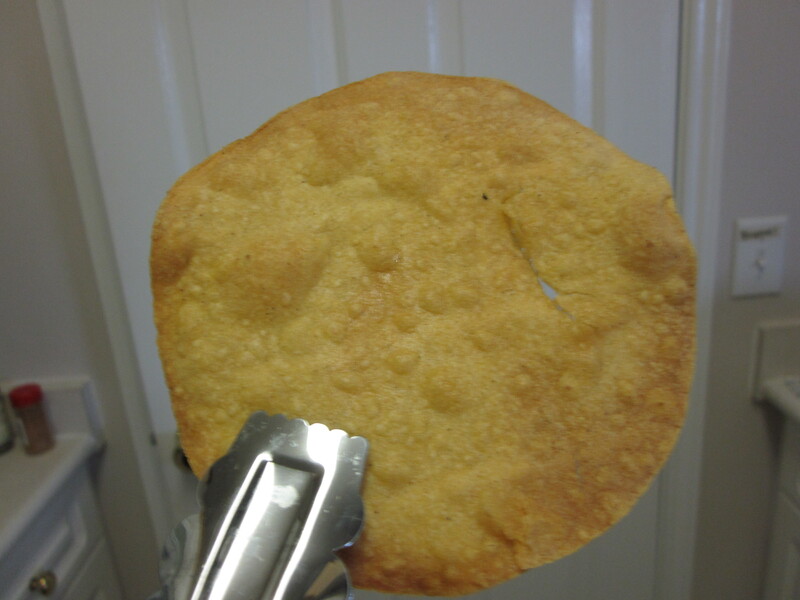 Plus, buying regular tortillas gives you flexibility in how to use the tortillas which does not come with the already crispy ones. Additionally, one cannot be certain of how the manufacturer made the shells crispy. If you make them at home – it is totally possible to do it without frying (and in 2 steps) which helps keep it nutritionally sensible. Here, let me tell you how! 1/4 cup grated cheese – I “cheated” and used pre-shredded Mexican blend that needed to be used. Normally, I use regular Cheddar. preferred Mexican seasonings – I used adobo, and ancho chile powder for the beans and about 1.5 tbsp taco blend for the meat. 1. Preheat oven to 375. I have a pizza stone so I leave it in there to wait for the tortillas. No pizza stone? Try a cookie sheet. 2. Start to brown gr. beef over med-low to medium heat. 3. Grate (or measure!) cheese. 4. Mix seasonings into beef, then add 1/4 cup water and turn up heat just a bit. Bring to a boil and then reduce to a mild simmer, stirring occasionally. It will turn sort of saucy and a bit thicker. It’s done when it doesn’t look like beef sitting in water anymore. 5. Put beans on to heat through. Add in 3-4 shakes of your seasonings and stir. 6. 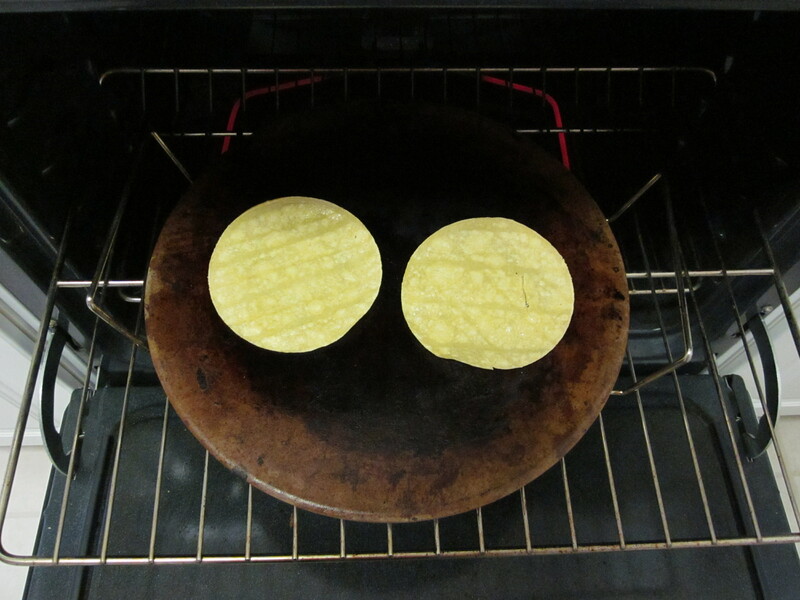 Spray both sides of the corn tortillas with your cooking spray and lay flat on your cooking surface. Let bake for 5 minutes. 7. 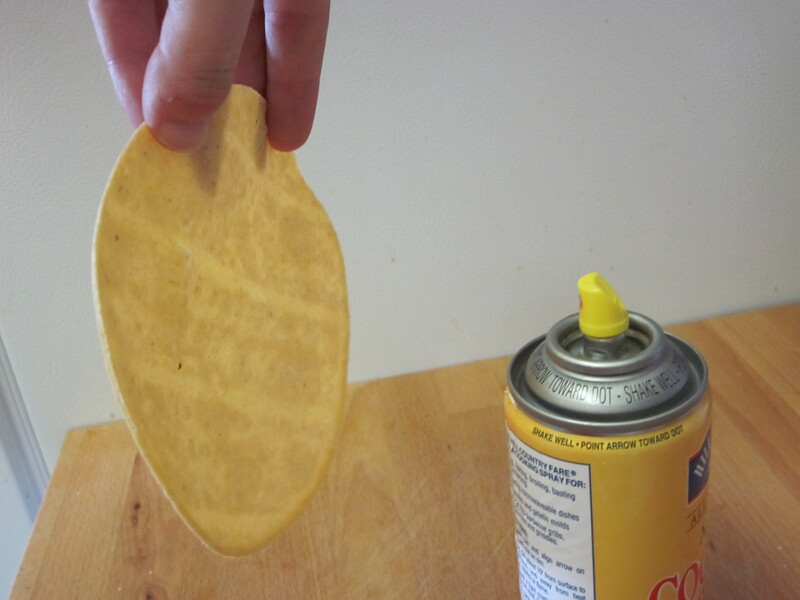 Check your tostada shells. If they aren’t done, flip them over for another 2 minutes and check every 1 – 2 minutes until they are the brownness and crispness you like. Once they start to turn though, keep a good eye on them because they’ll burn in a hot minute. Trust me. 8. Let shells cool while you taste your beans and meat and adjust seasonings as desired. 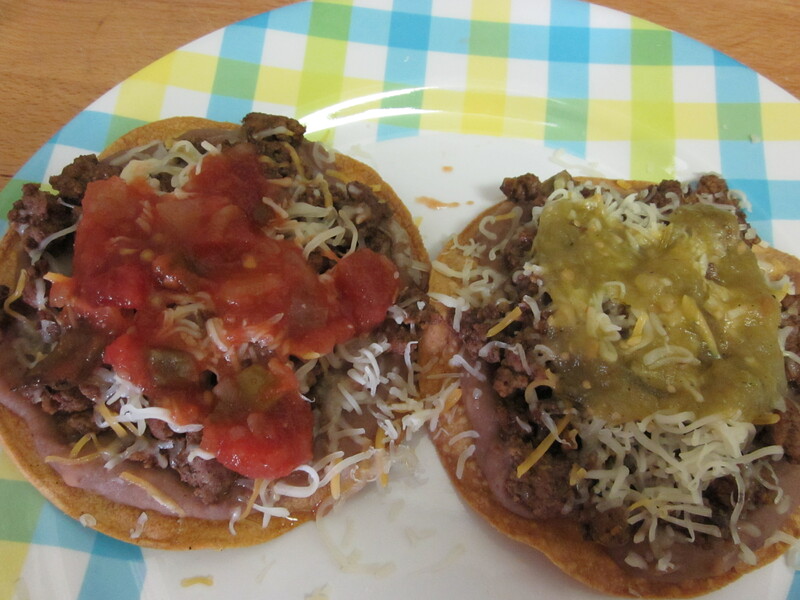 I suggest layering your toppings: beans, beef, cheese, then salsa. It really is pretty simple and can all be done in 20 minutes or less, which is an extra plus. If you feel the need to add things like lettuce or tomato to your tostada, go right ahead. 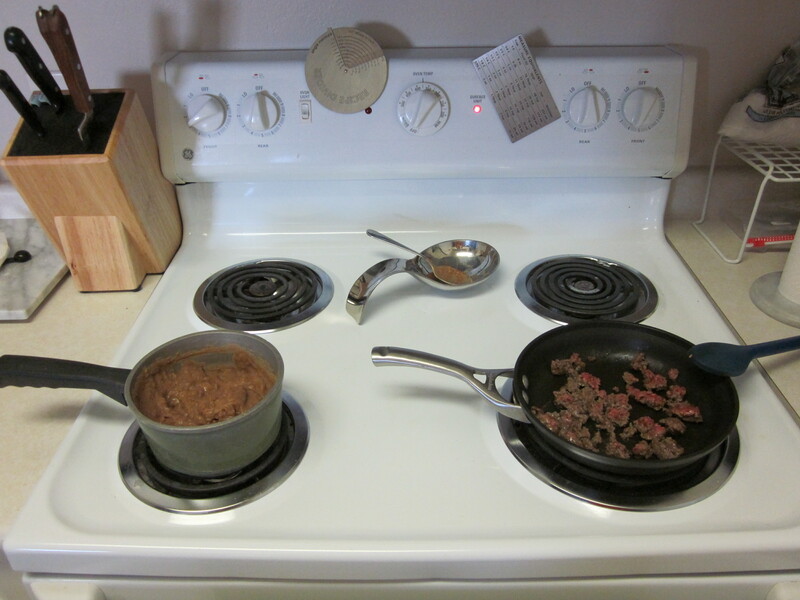 Beans, meat, and cheese are really all I want when I”m making this dish. The shells can be topped with just about anything…guacamole, queso, beans and eggs, sauteed vegetable mix – whatever floats your boat. It’s really quite versatile. One could add onions or peppers to the meat mixture. Black beans could be subbed in for the refried beans. Spices can be changed up, decreased or increased to alter the flavor as well. The variations are, in my opinion, endless. A note about the ground beef: As I am using a leaner meat, it’s important to cook it slower and over a lower heat so that it doesn’t overcook and dry out. I never went above #6 on my dial except to get it to boil, and then I turned it down to 3 or 4. Don’t rush it or you could be sorry. Again, trust me. Adding the water helps with this at the end, but it cannot rehydrate overcooked meat. You can use a higher fat ground beef if you like and you won’t have to worry about it quite as much – but it’s still good to keep in the back of your head. As there are few ingredients in this dish, it would be difficult to camouflage dried out meat.